Chimney King Enterprises, Inc is a leading full-service Long Island chimney company. Since 1982, we have been providing the residents of Nassau and Suffolk Counties with high-quality chimney care that they can count on! Whether you are interested in having a new chimney installed, or you need your existing chimney maintained or installed, the experts at Chimney King Enterprises, Inc will not only meet your needs, but we will exceed them! There’s no other chimney company on Long Island that can compare to our high-quality workmanship, and our fast, efficient, and affordable service! A fireplace is one of the most sought-after features on Long Island. It makes a house so inviting and adds instant warmth. There really is nothing better than gathering around a roaring fire with your loved ones during crisp fall evenings or in the middle of a snowstorm. It’s just such a relaxing experience. But, although a fireplace is certainly a wonderful feature, it can quickly become a dangerous one if the chimney isn’t properly cared for. For example, if your chimney isn’t professionally cleaned, there is a huge risk of fire. Or, if your chimney is damaged in any way, there’s a chance that the entire structure could come tumbling down. At Chimney King Enterprises, Inc, the safety of your family and your home is our top priority. We use the latest technologies, the most advanced tools, and the most innovative strategies to fully inspect your chimney and complete the necessary cleaning and/or repairs. We know that there are a lot of chimney services to choose from. So what is it that sets Chimney King Enterprises, Inc apart from the crowd? It’s our commitment to providing each and every client we serve with superior workmanship and fast, efficient services. As a licensed and insured full-service chimney company, we truly love what we do. To us, building, maintaining, and repairing chimneys isn’t just our livelihood: it’s our passion. There is nothing better than helping our neighbors get maximum enjoyment from their fireplaces. In fact, the only thing that’s better is knowing that we are improving the safety and well-being of our clients with our stellar services. Since we are a local chimney specialist (we are located right in Copaigue, New York), we understand the needs of fellow Long Islanders. We know that a fireplace is a wonderful feature in a home and that gathering around it can bring so much joy to homeowners. We also know that many people in the local area rely on their fireplaces for heat throughout the year. Lastly, we understand the unique characteristics of the environment and climate on Long Island. With that said, our staff is truly knowledgeable in handling the unique issues that many Long Island homeowners experience with their fireplaces, and we know exactly how to fix them. Furthermore, we know how vital proper chimney maintenance is to the safety and security of your home and loved ones. To ensure that all of your needs are met, Chimney King Enterprises, Inc only employs the most qualified chimney care specialists. Every member of our crew has received extensive training and has years of experience. From brand new builds to cleanings, and from basic repairs to complete overhauls, the staff at Chimney King Enterprises, Inc can handle any and all of your needs. In fact, most of our clients have been relying on our high-quality services for decades! And many of our new clients are referred to us by our existing customers. All of the referrals that we receive are a true testament to the outstanding workmanship and incredible value that we offer. · Builds and repairs. Our crew will identify and repair any and all chimney issues, including caps, dampers, liners, and more! If your chimney is in disrepair, we can completely rebuild it and turn your fireplace back into a functional feature. 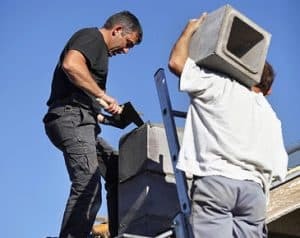 If you no longer want to use your fireplace, we can remove your chimney for you, too! · Chimney caps. 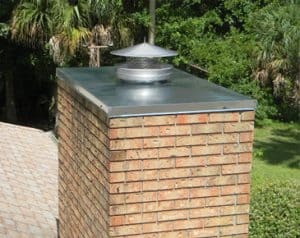 We can replace and install a brand new, state-of-the-art cap on your chimney. Our caps are made of the highest quality materials to ensure durability and long-lasting protection that you can rely on. · Chimney cleaning. At Chimney King Enterprises, Inc, we always say, “A clean chimney is a happy chimney”. Our professional chimney sweeps will ensure that your chimney is properly cleaned and that all buildup and residue is removed (we can remove animals and nests, too!) With routine cleanings, you can ensure your safety and avoid expensive repairs down the road. · Chimney liners. A liner is perhaps the most important element of a chimney. Our professionals will inspect your liner to ensure that it is in proper working order. We can also make the necessary repairs or install a brand new liner. · Dampers. Improve the efficiency of your fireplace and safe money with a Lyemance damper! At Chimney King Enterprises, Inc, we specialize in the installation of these high-quality dampers. Once a damper installed, you’ll notice a real difference in your fireplace and utility bills! No matter what kind of chimney service you require, you can rely on Chimney King Enterprises, Inc to assist you and not only meet, but exceed your expectations! For All of Your Chimney Care Needs, Contact Chimney King Enterprises, Inc Today! To learn more about us, the services that we offer, and how we can help improve the safety and function of your chimney, contact us today! We look forward to assisting you and servicing all of your Long Island chimney service needs!